12 minus 1 equals 6. I had some blueberries and a couple of overripe bananas that I needed to put to good use, so I found a recipe on Allrecipes.com for blueberry banana muffins. Perfect! So I made them and put them on top of the stove to cool. Several hours later, I was outside in the back yard when I heard a crash that sounded like it came from the kitchen. I looked towards the sliding glass and I see a very guilty looking Dora running towards her kennel. I went inside to see what the noise was all about and I see an empty muffin pan and 3 muffins on the floor. I look on the stove and the other pan only has 3 muffins in it. I asked Manuel how many he had and he said one, which means Dora must have downed 5 (although I'm sure her partner in crime, Peabrain, helped her with those). So much for having muffins for breakfast tomorrow! I suppose I should be happy that someone likes my baking skills enough to risk getting caught pulling the goods off the stove. I know she was consumed with guilt because she ran for her kennel when they came falling down. Nonetheless, the guilt didn't stop her. She was probably just happy that someone made something other than liver and cilantro. Can't blame her for that! A few days ago I noticed that the 99¢ movie store flipped their first 9 around and became the 69¢ movie store. I thought, "what I nice thing to do in this economy. Who can't afford 69¢ for a movie?" So I told Manuel and he was all over it. We went to the store, picked out a couple of movies (Avatar (the new millennium's answer to the Smurfs) and another one that was so good that I can't remember it's name) and had a fine time watching them last night. He went to return them today and realized that the movies are NOT 69¢ unless you choose one from the middle aisles in the store. Come on, who ever rents those? The new releases are $1.49. What an outrage, I know! Pretty clever of them though to make you think they are saving you money when in fact they are upping their price by 50%. I should have known better. With Blockbuster and Hollywood Videos closing on every corner, why would the 99¢ be able to afford to lower their prices? Oh well, still beats paying ten bucks per person to go to the actual theater I guess. Speaking of which, because I procrastinated so long to go see the new Runaways movie while it was in town, I now have to either go to Los Angeles or somewhere in Wyoming to see it. I have a feeling that's not going to happen. I guess I'll have to wait until it gets to the $1.49 movie store. Attract the classiest birds in town with these colorful, sparkly birdhouses! What bird could resist living in these fine accommodations? These houses were especially fun to make because not only did I get to go crazy with my paints and glitters, but I also found new uses for some old scrapbook embellishments that never made it to my books! Lightly sand your birdhouse if needed. Apply one color of paint onto the birdhouse using a paintbrush and let dry. Add other colors until you are satisfied with the design. I used a palette knife to apply several colors at one time because I like the bold designs that get created this way. You can choose to do this, or follow the more traditional method of using a paintbrush for all colors. Let dry completely. Add various scrapbooking embellishments to your birdhouses. You can either glue them on with Weldbond glue (I like this glue because it is super strong and you don’t have to worry about them falling off later), or use a thumbtack if the embellishment is meant to be fastened to paper with either a brad or an eyelet (like the flowers and the metal frames). They push into the wood relatively easily and add some extra color to the house. Apply Designer Dries Clear adhesive to the ledges of the birdhouse. Sprinkle the glitter color of your choice on top of the adhesive and tap off the excess. Let dry. This is the last project that you’ll see from me for the Art Glitter Institute, since my time as Guest Designer has come to an end. 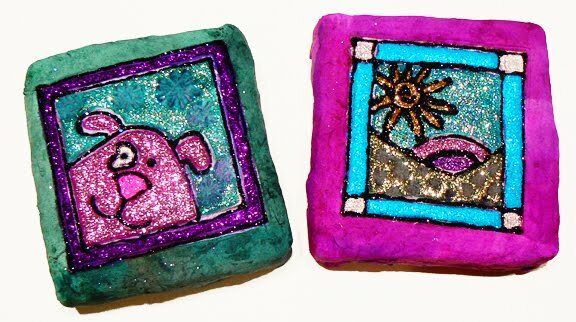 I have really enjoyed coming up with new and inventive ways to use one of my favorite art supplies…Glitter! I hope you will continue to visit me at my website and blog (www.thepeculiarpalette.com) where I will continue to post new projects. I look forward to seeing you there! I was lucky enough to get Manuel to postpone making his gourmet dinner for a day, but it was just a matter of time until it actually happened. I got up early yesterday to deep clean the kitchen, and in typical Manuel style, the second I was done cleaning he comes into the kitchen wanting to start cooking. After explaining that I would strangle him if the kitchen wasn't in the same sparkling clean condition when he was finished, he takes out all the ingredients, pots, pans, cutting boards, knives, and whatever else he can find to clutter up the counters. Then, he somehow transformed himself into someone Emeril-like. It was amazing. You should have seen him slicing and dicing his organ meat and accompanying produce! I was both shocked and irritated. Irritated because for 4 years, every time I tried to get him to boil water or peel a potato he claimed to 'not know how'. He can rest assured that I will be putting his newly exposed talents to work on a regular basis from now on. Shortly after he was done chopping up his ingredients and started cooking them, the stench of liver and cilantro took over the house and stayed there for hours. If the liver wasn't bad enough, he had to use an entire bunch of my #1 most hated edible plant....cilantro. Then, as an added bonus, he would eat a gob of it and then blow his cilantro breath in my face. Barf. The whole ordeal was great for my diet, because it caused me to lose my appetite for the better part of the day. Strangely enough, he didn't add any of his pickled cactus parts to his concoction. I guess he thought it was delectable enough as it was. Maybe if I'm lucky he'll save them for another delicious recipe. Mmm, can't wait for that. Needless to say, I went running in the opposite direction when he offered me a liver and cilantro burrito. I would have rather poured myself a big bowl of the dog's Pedigree than eat one of those. But at least now I know he can cook. I just have to work on getting him to use different ingredients. Today he goes to the store and comes back all excited about the delicious dinner he is going to make. He starts unpacking the bags and out comes a variety of produce, a jar of pickled cactus parts, and 3 pounds of liver. Yes, liver. Three full slimy pounds of it. Now, I can't say I've ever had liver. Thankfully my Mother never made me eat it (although liverwurst sandwiches were a staple in my lunch bag in grade school). But after 38 years of living without it, I'm certainly not going to start eating it now, especially garnished with pickled cactus and God knows what else. Who goes to the grocery store where any delicious meal is at your fingertips and chooses LIVER? I know this is was a carefully thought out plan he plotted to get me to stop complaining that he never cooks. A sick and twisted plan that only he is capable of coming up with. He is going to pay for this. I'm not sure how yet, but I know it will include about a week or two's worth of eating something made with gobs of celery, peas, and cabbage. If you have any recipes using these ingredients, be sure to forward them to me! If you haven't visited the Art Glitter Institute's website, you really should! Where else can you find over 400 colors of glitter in different sizes and shapes? Plus they are always posting new project ideas so if you're in a glitter rut, this is the place to go to find something new to make. Have fun! This is a technique I learned at a workshop with Leighanna Light that I built on it to create these glittery stamped paper clay blocks. You can use whichever rubber stamps you’d like to create the images, although simpler designs work better. Knead a 1 or 2 inch piece of paper clay with about a half inch dollop of PVA glue until it is soft, sticky and pliable. Cover the top and sides of the woodblock with the clay mixture. Repeat this step if necessary until the whole block is covered with a layer of clay that is approximately 1/8 inch thick. Make sure the clay is relatively smooth. Ink a stamp with the dye ink pad and stamp the design into the wet clay on the wood block. Let the clay dry completely (this may take several hours). Paint the areas outside of your stamped design with your desired color of Adirondack Re-Inkers or watered down acrylic paint. Let dry. Use the Designer Dries Clear adhesive with the metal writing tip to coat a section in your stamped design. Pour your desired color of glitter on the glue and shake off excess. Let dry. Repeat step 4 with different colors of glitter until you have the desired effect. You can either glue a magnet on the back of these to hang on your fridge, or attach a small picture hanger and hang it on your wall. As many of you know, I was laid off last August and decided to go to art school for awhile before I got a new job. I took a ridiculous amount of classes in a short period of time, and consequently was very busy. So busy that I let a bunch of other things slide, like walking the dogs (at least they still got fed), remembering birthdays, spending time with relatives and friends that were in town, and communicating to any extent through Facebook, my Blog, and email (which I am currently about 3 months behind on). I just wanted to apologize for falling off the face of the earth for the last 9 months or so, and want to let everyone know that I am back. I will be blogging regularly, working on relaunching my website and Etsy shop, developing new workshops and launching my rubber stamp line. Lots of exciting things are on the horizon and I can't wait to take the next steps! I'm looking forward to talking to everyone soon! In the mean time, here is what I turned in for my final photography project. It explains the last 9 months of my life in a nutshell. The scene you are viewing is essentially what I’ve been seeing everyday for the last nine months. When I got laid off in August 2009, I felt like my life was falling apart. After going to work every day for 10 years and having a steady paycheck, it’s frightening to think about what can happen when it’s gone. Luckily, along with my layoff came a small severance package and some money to re-educate myself so that I could find a new career. I didn’t have to think twice about what my next step would be. I wasn’t happy in the corporate retail world and knew this was my chance to get out and do what I always wanted to do in my heart…become an artist. Because my time and finances were limited, I knew I had to get as much education as possible in a very short period of time. I took 57 credits worth of art and small business classes at three different colleges in two semesters. My days were filled with painting, ceramics, sculpture, photography and printmaking for thirteen hours a day, everyday. Although it was exhausting, it was one of the best times of my life. Believe it or not, I am sad to see it coming to an end. This photograph signifies everything my life has been since being laid off. The pieces of the montage symbolize the pieces of my life being put back together. They aren’t quite aligned completely, but I know they will be someday. The 3 paintings represent my life in general. The Peculiar Palette is the brand name that I have invented for myself, the painting of the girl is a self portrait, and the dog represents the animals in my life and the direction my artwork is going. The empty easels represent the art I have yet to make. Now that this phase of my life is just about over, I now have to move on to the next thing…finding a new job. Although I would love for it to be art related, I know in this economy that it might not be possible right now. Regardless, I am going to continue to pursue my quest to become a successful artist and not give up until I get there. In the mean time, I will always have this photograph to remind me of who I have become and what I want my life to be. It will also give me the strength to realize that whenever life throws something my way that breaks me down, it is always possible to put the pieces back together. Goin' to the bead show today....If you are in Phoenix you should go too! Directions: US 60 (Superstition Fwy), exit Country Club Dr.